This year’s Missouri Christmas trees have been installed at the Governor’s Mansion in Jefferson City. The annual lighting is Friday, December 2nd, with public tours taking place the same evening and the following Saturday afternoon. According to Dentner, the Eastern Red Cedar is native to Missouri and something people would commonly “see on the side of the road”, but hasn’t been part of Christmas decorations in recent memory at the Governor’s Mansion. The inside trees are all white pines from the Pea Ridge Forest Christmas tree farm and wholesale nursery near Hermann. 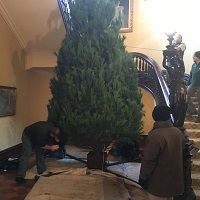 An 18-foot tree sits next to the mansion’s staircase, while one standing 10-feet is on the back porch. Six 7-footers are located throughout the building’s first floor. 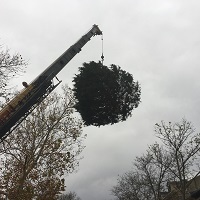 Dentner says the Conservation Department finances the harvesting and delivery of the inside trees and provides delivery of the large outdoor tree with no charge to the resident who donates it. The annual lighting ceremony takes place Friday at 6:15 p.m. with public tours offered the same evening and the following Saturday afternoon. Visitors will be able to view decorations in several rooms of the historic brick mansion, which has been the home of Missouri Governors since 1871. Eight central Missouri school choirs will perform at various times during the lighting ceremony and public tours Friday and Saturday at the mansion. Volunteer guides will help describe historical features throughout the building. The choirs performing Friday are from Boonville High School, Blair Oaks High School, California High School, Helias Catholic High School and Jefferson City High School. Chiors from Sacred Heart School in Sedalia and Simonsen Ninth Grade in Jefferson City are scheduled to sing Saturday. After the Saturday tours, visitors are encouraged stay in downtown Jefferson City to view the Jaycees’ annual Christmas parade.